These assets were crafted to fit in a PS3™ game case. You can produce your own physical copy too - just print the artworks appropriately, and burn the game's ISO to a regular DVD! 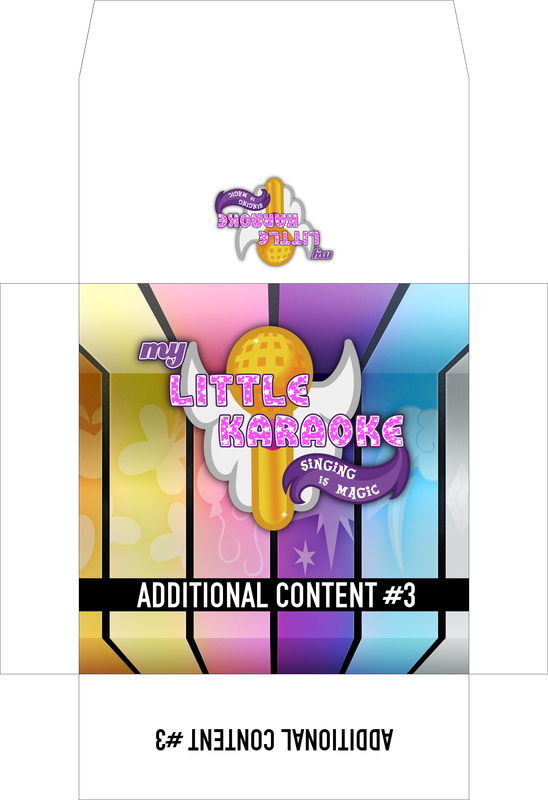 Getting started with MyLittleKaroke (8 pages). Print size: 236mm × 146mm / 9.28in × 5.74in. Print size: 272mm × 149mm / 10.7in × 5.9in. Regular disc label sticker (apply after burning the disc). Print size: 120mm / 4.72in. 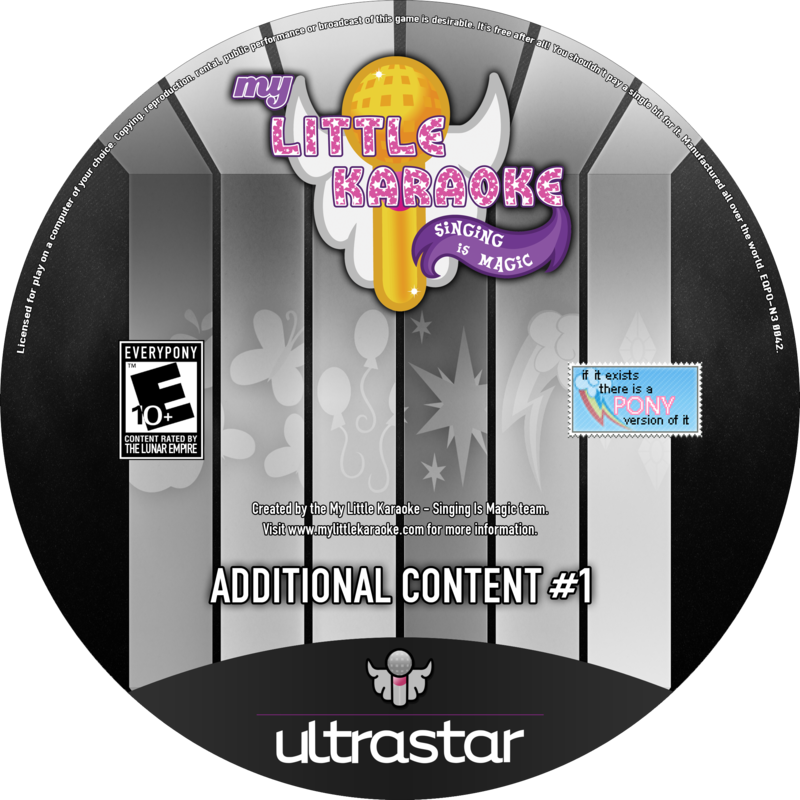 Additional Content disc label sticker (apply after burning the disc). Cheap foldable alternatives to the rigid disc cases. Logos, cards, ponies and other GFX assets for your own creations. Skin your standalone USDX 1.3+ install with the MyLittleKaraoke theme. Copy to the Ultrastar "Themes" folder, then activate in the options screen. Copy this file to the "webs" folder of a vanilla Ultrastar World Party or USDX 1.3+ setup to be able to submit scores to the My Little Karaoke online leaderboards. Windows only. This small, run-once patch fixes the "No Valid Themes Found" error that may occur on Windows Vista and ulterior. This will reset the game's settings. 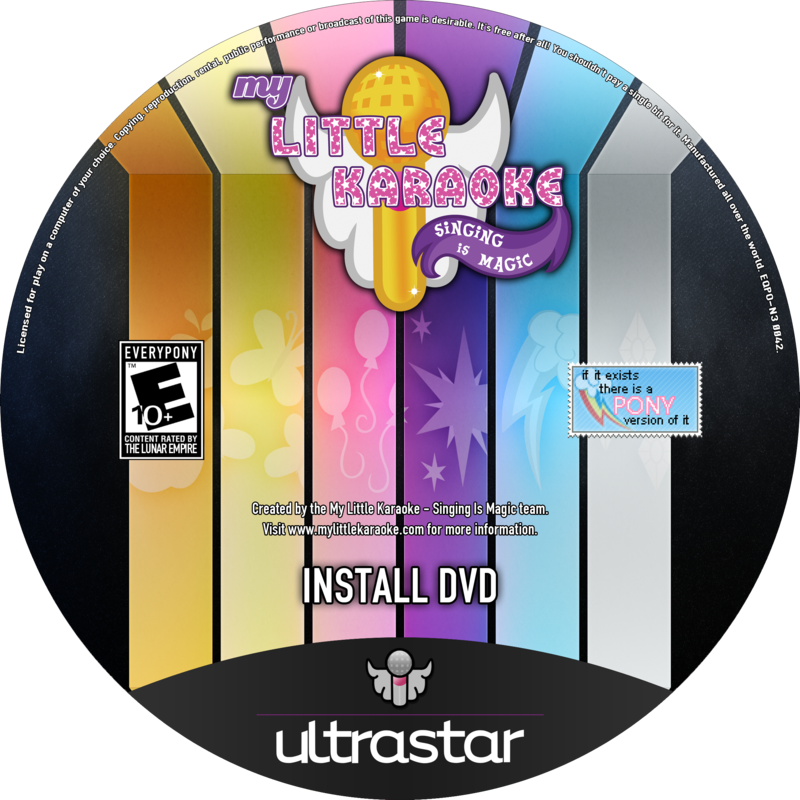 Songs installed with the first Additional Content Disc are in read-only mode and will not be properly removed by the current uninstaller, potentially wasting hard drive space. Run this fix before uninstalling the game to avoid this. Not needed if you installed the second Additional Content disc. Run this once if you encounter an error with the Beta Channel updater despite having installed all previous releases. This will also change the install path of .mlk files. Game Manual, Box Art, Disc label: designed by FloppyChiptunes. 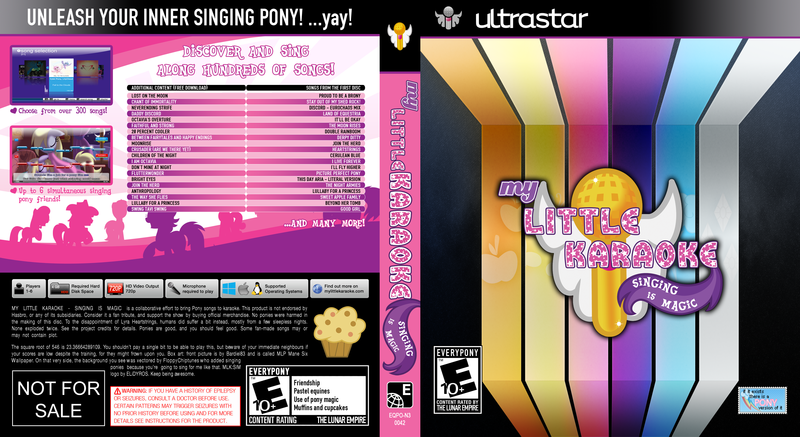 USDX theme: designed by MyLittleVisuals. Background art: "MLP Mane Six Wallpaper" by Bardiel83.